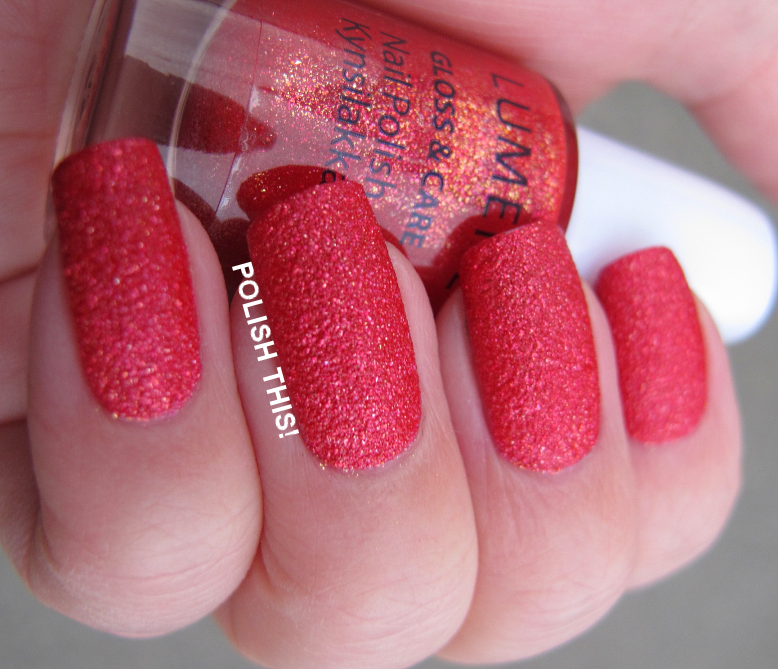 Lumene Brilliant Sand - Polish This! 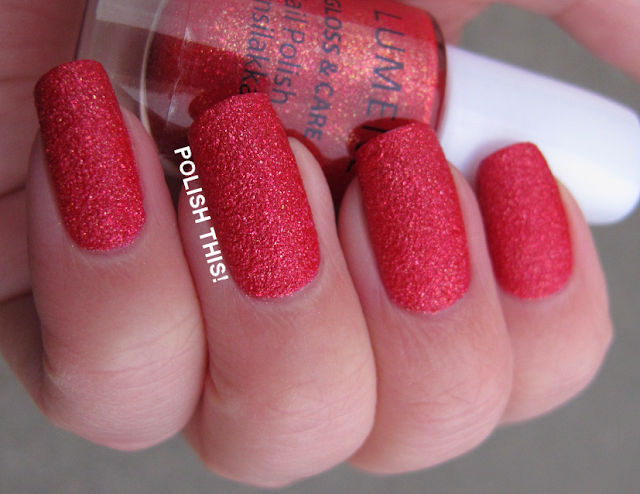 I have a quick post for you guys today with a gorgeous textured polish! I hope you aren't bored with these yet as I think this is quite a nice coloe and worth taking a look! So this is a polish called Brilliant Sand from Lumene and I have two coats here with base coat but of course no top coat. If you aren't familiar with the brand Lumene is a Finnish makeup and skincare brand, quite a big brand here in Finland. Honestly, they usually make quite boring polishes and so I only own couple that have stand out to me colorwise. But lately they have been making an effort on keeping up with the trends by making some glitter polishes, toppers and a textured polish line. This one is of course from the textured line and I picked this up as it looked really gorgeous in the bottle and I didn't have a textured polish in a color like this before. The quality with this one was pretty nice and this was easy to work with. However, it was a bit on the thick side and the brush is really chunky so applying it neatly especially on the pinky finger nails was a bit difficult. I do like wide brushes but the brush in these Lumene polishes is chunky overall, I'd prefer if it was a tad more flat. 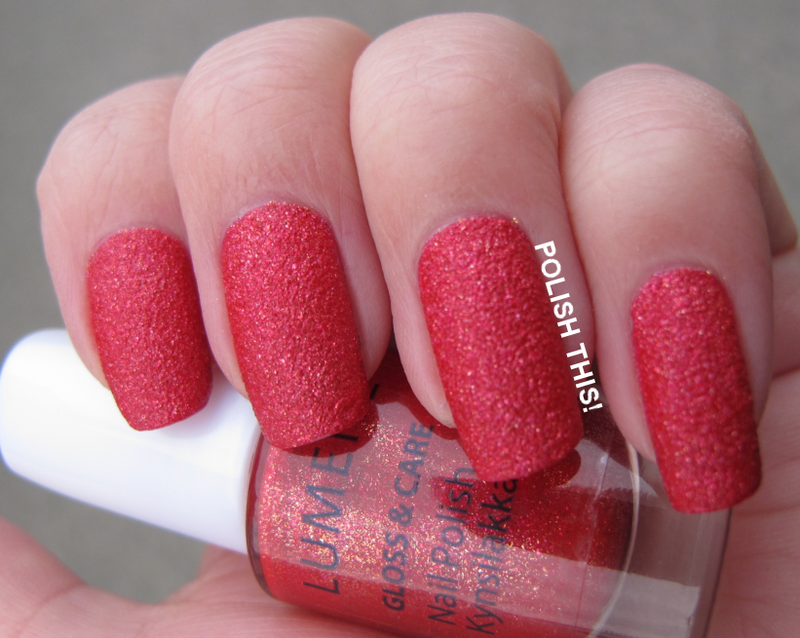 Like I said, I really loved how this looked in the bottle and it looks quite gorgeous on nail too, but somehow some of that sparkle that you can see in the bottle doesn't really come out on nail. Of course it sparkles more that you can see in these pictures as pretty much all textured polishes with shimmer do, but it looks soooo gorgeous in the bottle and I wish it would have looked just like it on nail too. Tänään esittelyssä Lumenen tekstuurilakka Brilliant Sand (Hiekan hehkua). Pullossa lakka näytti niin uskomattoman upealta, että se oli vain pakko kotiuttaa! Kynnellä ihan sama hehku ei valitettavasti toistu, vaikka lakka on toki upea kynnelläkin. Lakkasin kaksi kerrosta aluslakan kera ja tämän kanssa oli melko helppo työskennellä, vaikkakin Lumenen joka puolelta paksu suti teki paksuhkon lakan levittämisestä hiukan hankalaa ainakin pikkurillien osalta. Lakka oli joka tapauksessa siis todella nätti, eli jos tekstuureista tykkäät, niin kannattaa tämä kurkata ehdottomasti. Vastaampas tähän itse, kun ostin tän saman lakan :o) Hiekan hehku on huomattavasti kirkkaampi kuin hiekka Minni. I like!